Kratom is now available at Funky Bean! 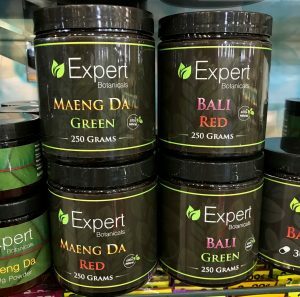 We have Expert Botanicals, OPMS Silver, and OPMS Gold brands in either the Bali strain or the Maeng Da strain. Both of these brands have surpassed their competition in quality. Depending on what issues you would like to address, there are different strains of the plant. We went on Google to check out the comparisons and simplify them for our customers. Maeng Da and Bali are the two most popular strains. Each strain has different colors to categorize the effects. Bali Green is a potent pain killer, enhances cognitive thinking, but does not have a heavy sedation side effect. Bali Red is similar to Bali Green, but it has some sedative properties. The Red strain would be best for sleep and pain issues. Maeng Da Green supplies mild pain relief, but excels in balancing emotions and improving your mood. Customers tell us that it helps them focus while increasing their patience with trying tasks or issues. Maeng Da Red is a stronger pain reliever than Maeng Da Green. The Red strain is known to help with anxiety as well, but again the Red might make you tired. The Gold strain is simply a concentrated form of Kratom. This Kratom extract should be taken in small doses due to its potency. Gold is the most similar to a Bali Red strain in that it has high pain relief abilities but may make you sleepy. The strains might be confusing. We like to think that Green means GO GO GO and Red means STOP and SLEEP. We always have a cheat sheet available with the above information in store and can answer any questions you might have. If you are curious about Kratom yourself, there is a new documentary on Netflix called A Leaf of Faith. In this documentary, several Kratom manufactures, users and advocates thoroughly explain the uses of Kratom and properties of the plant . We took notes, in case people have not seen it and have questions! Feel free to stop in with any inquiries.